FBI investigators work a crime scene outside of the Curtis Culwell Center after a shooting occurred the day before May 04, 2015 in Garland, Texas. 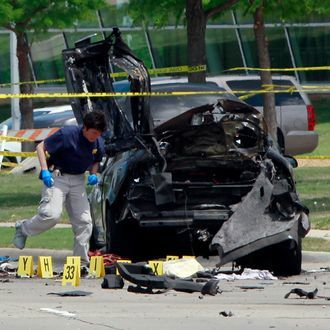 Elton Simpson, one of two men who opened fire at a Muhammad cartoon contest on Sunday, was investigated by the FBI from 2006 to 2014, and on Thursday the agency revealed that it warned police in Garland, Texas, about Simpson shortly before the event. FBI director James Comey said they reopened their investigation in March when Simpson began posting about ISIS on Twitter. “We developed information just hours before the event that Simpson might be interested in going to Garland,” Comey said. The agency issued bulletins about other potential threats as well, but it appears officers at the event hadn’t seen the warning about Simpson. “We on the ground had no idea, no information that these guys had left Phoenix and were on their way to Garland,” Garland police spokesman Joe Harn told the New York Times.